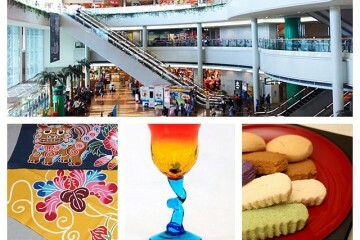 What can I do at ‘Murasaki Mura?’ Budget? Required time?? … We visited in person to answer those questions! 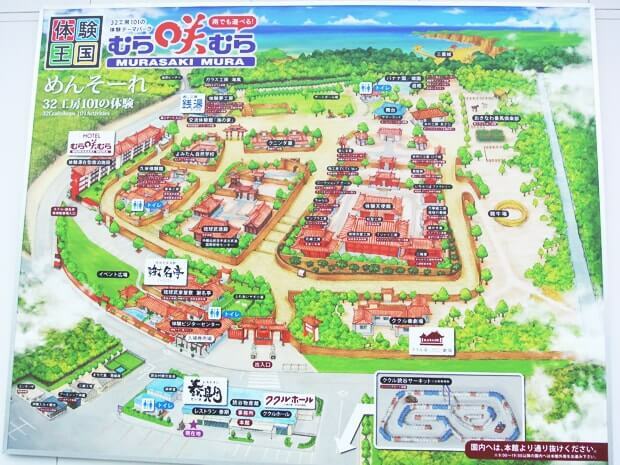 【1】What is ‘Murasaki Mura’ Like? 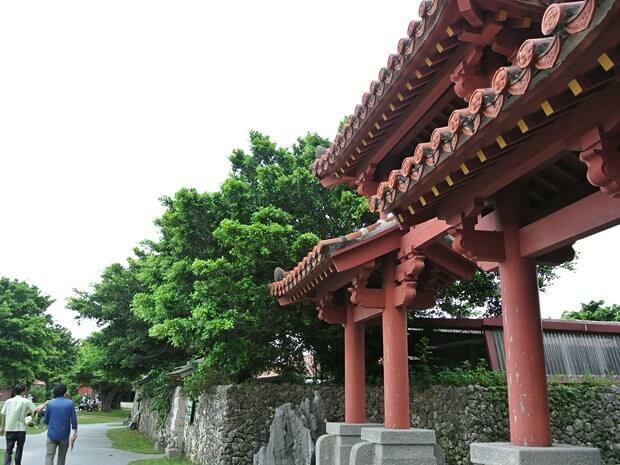 It is a sightseeing facility that replicates traditional Okinawa, namely the scenery and buildings from the Ryukyu era. Large-scale facilities from a TV drama have been reused and the ancient scenery spreads over their vast premises. 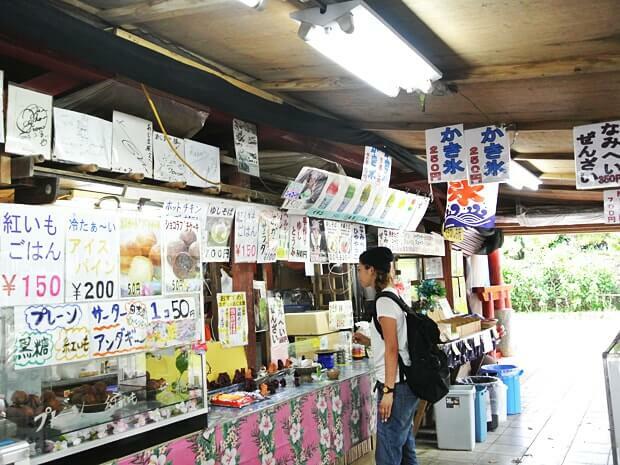 You can try authentic Okinawan experiences. According to their official website, you can try 101 different activities! 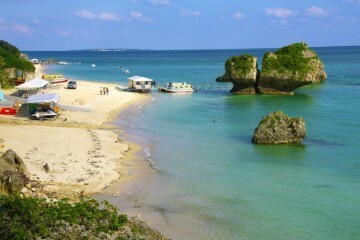 It is located along the sea in Yomitan Village, in the central area of Okinawa’s main island. 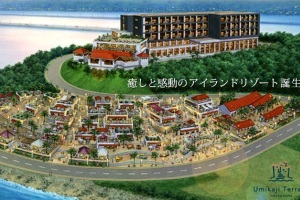 The area has many resort hotels. 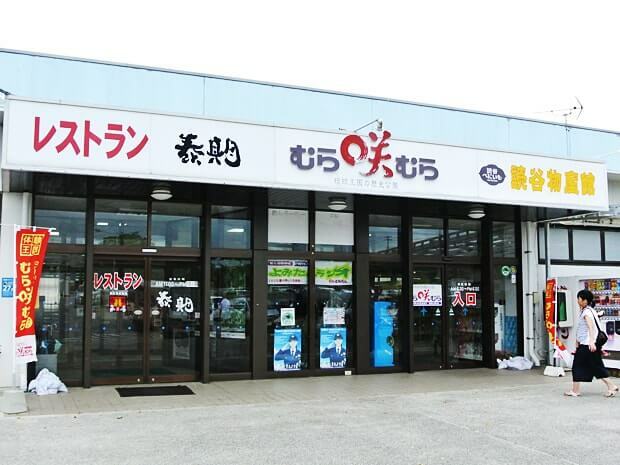 It is 1-1.5 hours’ drive from Naha. Open 365 days per year unless otherwise indicated. Opening hours from 9:00 to 18:00 (Last admission at 17:30). 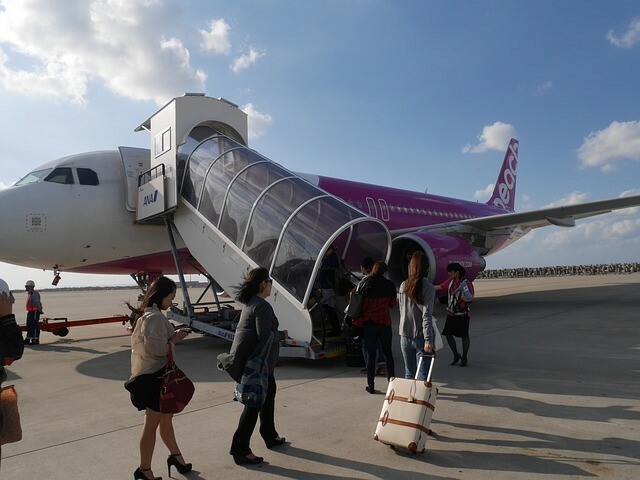 However, “Yumekobo,” which can be accessed from Gate No. 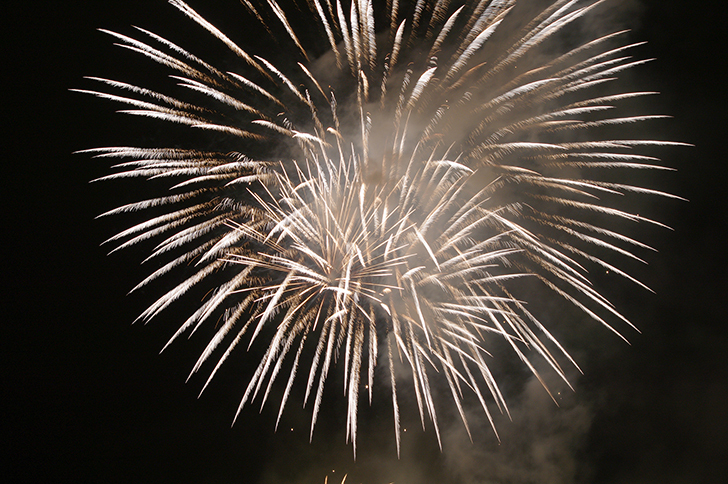 2, is open until 21:00 (Last admission at 20:00). 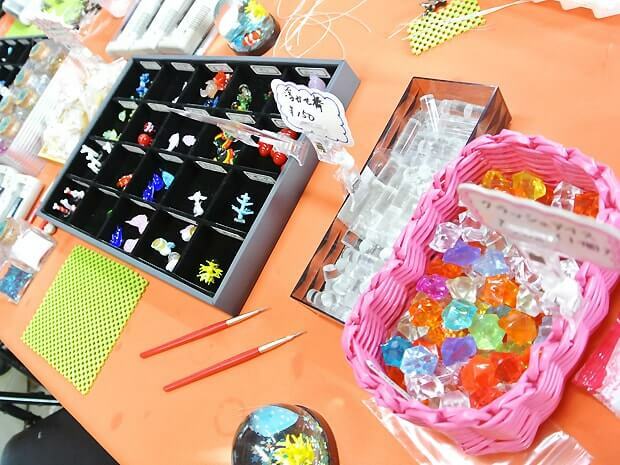 You can enjoy painting ‘shisa’ and whale shark figurines, and see shell art at the ‘Yumekobo’ area. Most activities require around 30 minutes-1 hour. 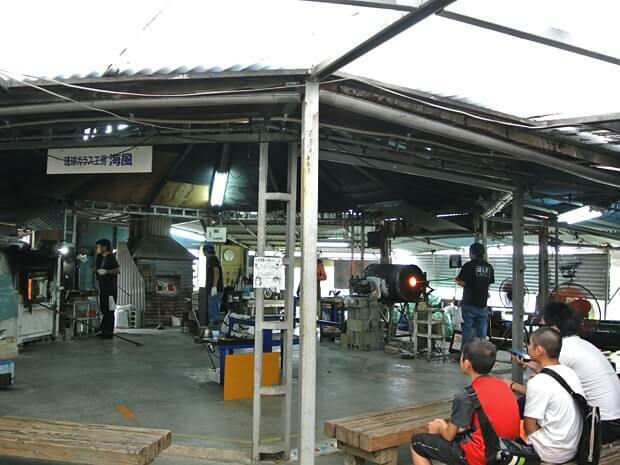 Some activities are short, such as the glass blowing experience (5-10 minutes), or the Ryukyu costume experiences (~15 minutes). 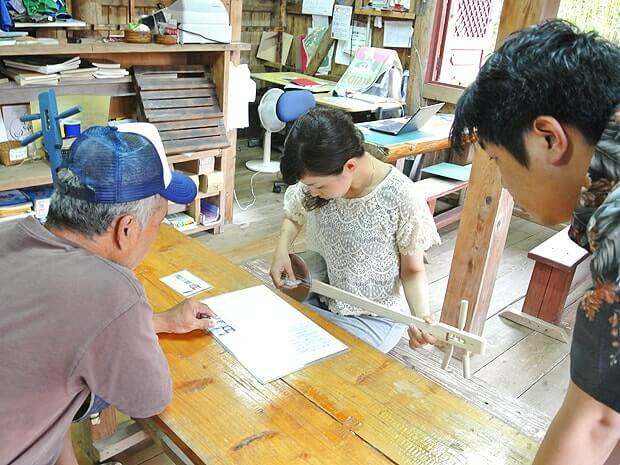 Nevertheless, the required time for each experience depends on the participants’ work speed. The marine experience takes a relatively long time. 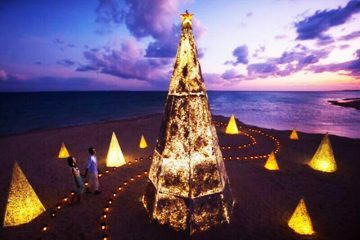 This is because the venue for the experience is the sea outside Murasaki Mura. 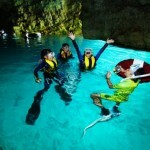 These activities require approximately 2-3 hours, and reservations are recommended. 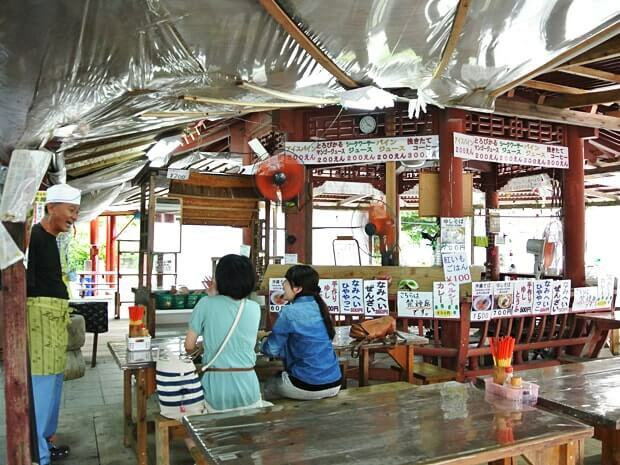 First, an admission fee is required (there is no charge if you only use the restaurant). 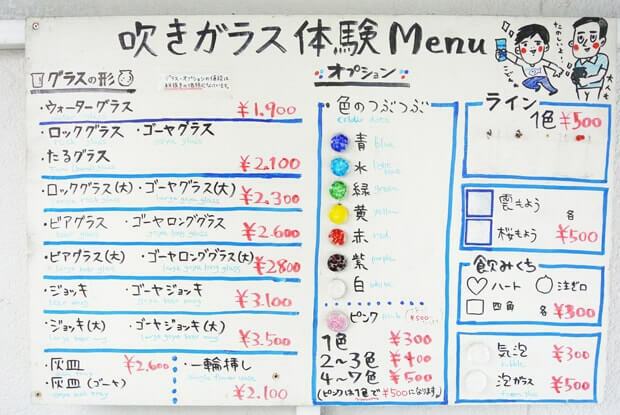 Most activities cost around 1,500-2,500 yen. 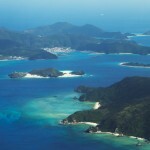 Some marine activities such as diving cost above 5,000 yen. 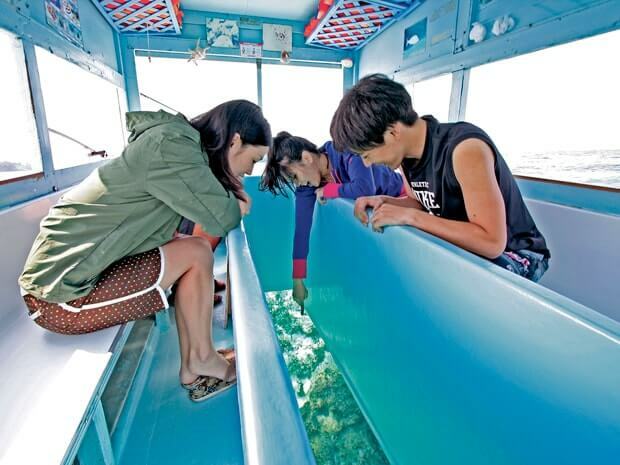 The most expensive activity is the ‘Whale Shark Snorkeling Experience’ at 9,100 yen. The required time is 2.5 hours, and the price reflects the rarity of what you can experience during the tour. Most activities do not require reservations. However, some activities require advanced reservations. 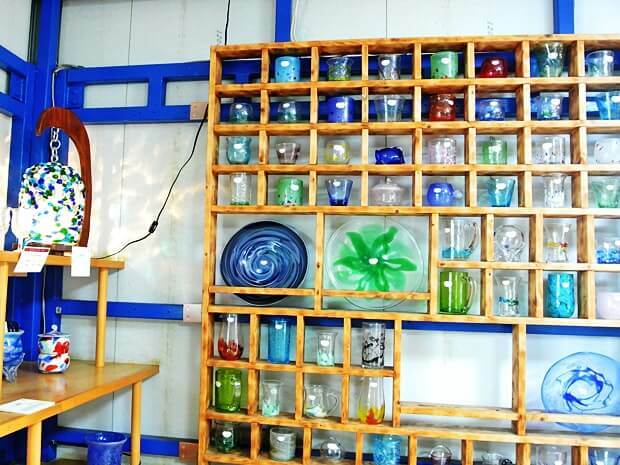 You can make traditional crafts and housewares. Assistance is provided, but the designs and shapes are up to you! 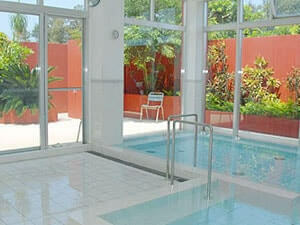 You can join most of the programs without reservations, which is very convenient. 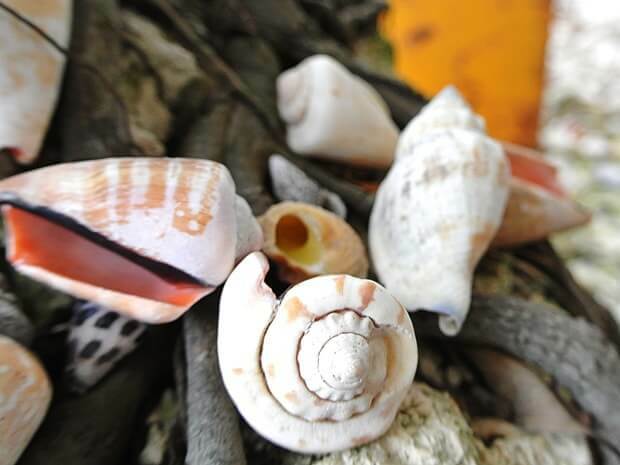 You can create traditional textiles called ‘Hanaui’ with a handloom. 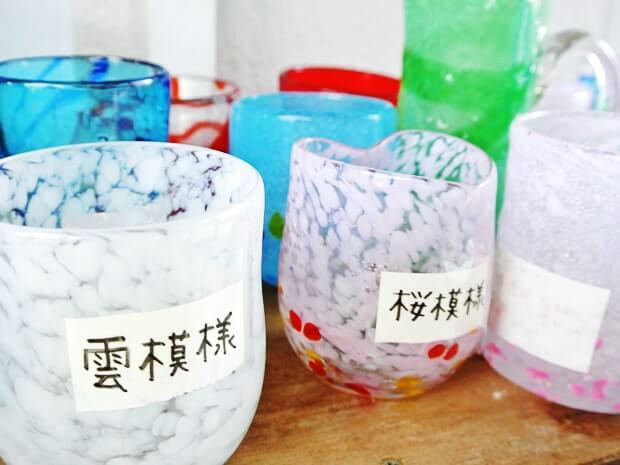 You can create beautiful Ryukyu glass. You can choose the colors, patterns, and shapes! 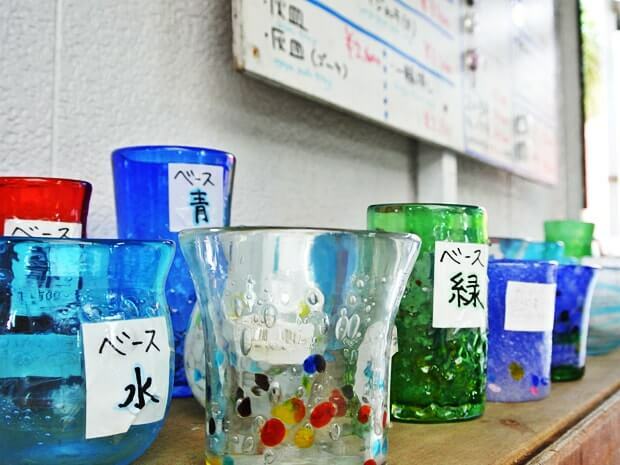 It is extremely hot inside the glass factory as the glasses are created at a high temperature! 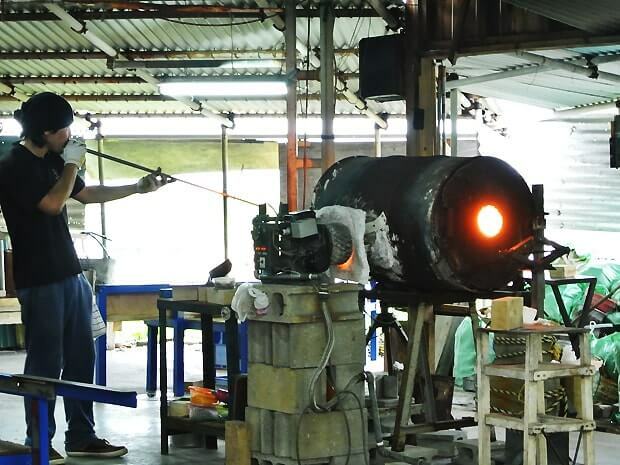 After blowing the glasses, they are shaped in a high-temperature furnace in no time. The experience itself is relatively short – 5-10 minutes, but concentration is essential. 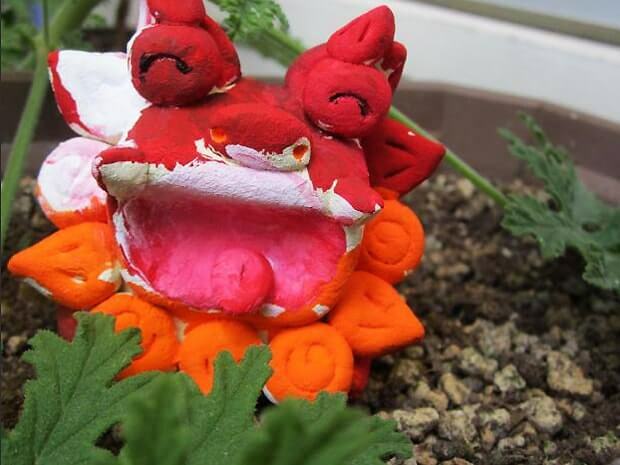 You can create a one-of-a-kind ‘Shisa’ using a combination of different shells. 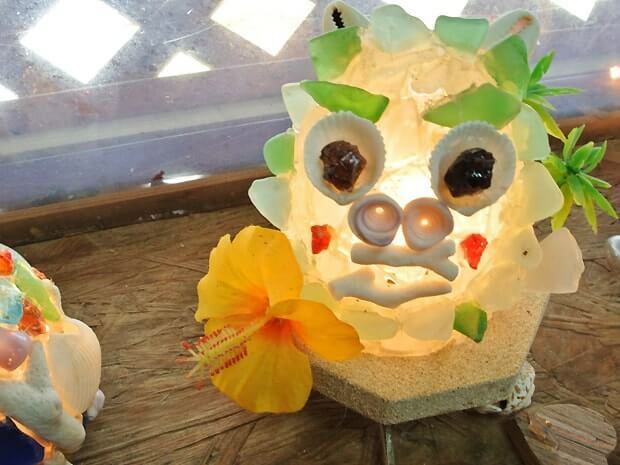 Decorate lamps with seashells, sea glass, and blown-glass fragments. 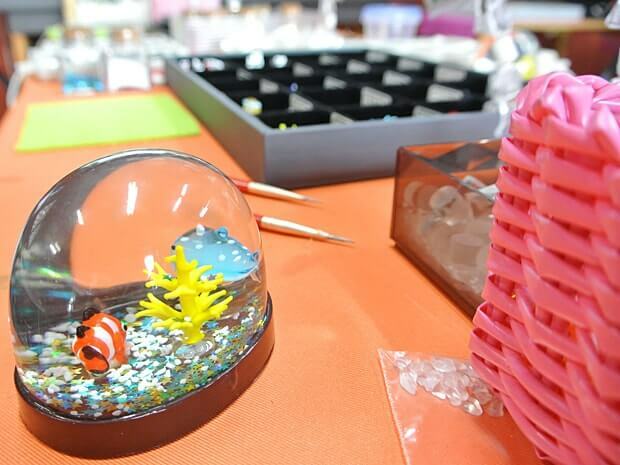 Create an ‘Aqua dome’ (like a snow globe) with a scene from under the sea. 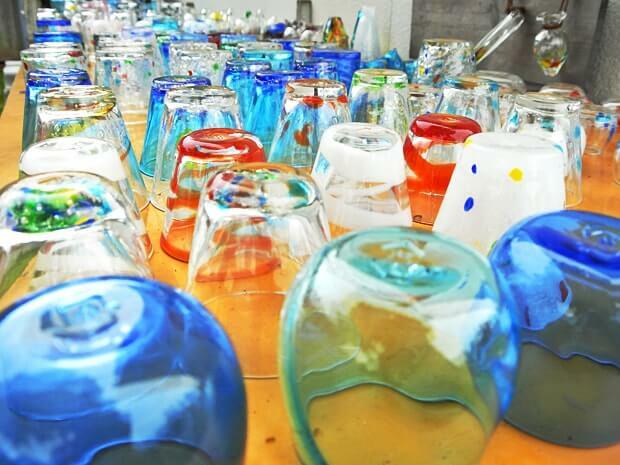 You can create original lampworking glasses and adjust the shape of the glass with heat from a burner. 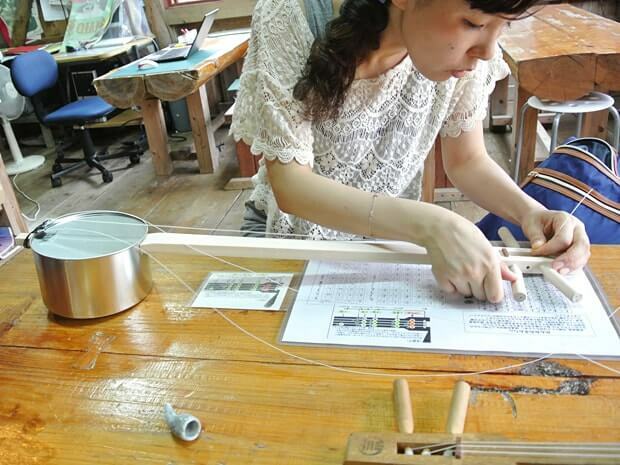 You can choose to produce a mobile phone strap, bracelet, or necklace. 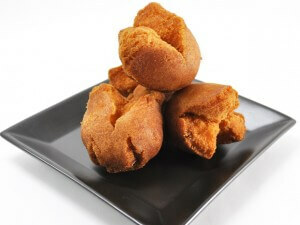 You can cook traditional Okinawan dishes such as ‘chinsuko’ (cookies) and ‘sata andagi’ (donuts). Kids also enjoy learning from the instructors (please bring an apron). 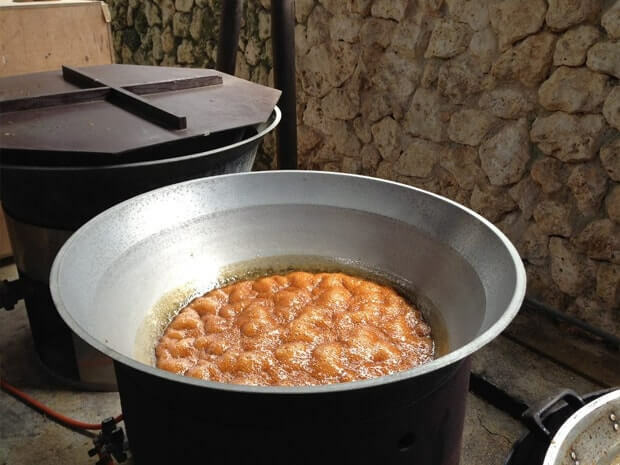 We made hot and fresh sata andagi here, and it was unforgettably delicious. 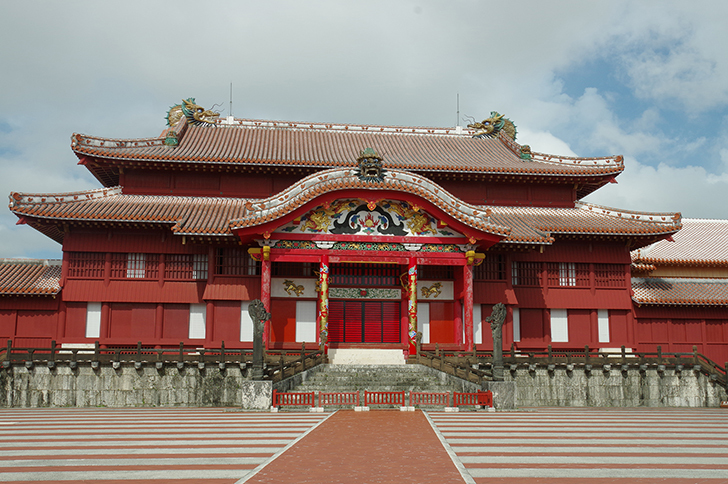 You can experience Okinawan culture with your whole body through dancing and traditional performances. *Most activities require advanced reservations, or a group to participate. 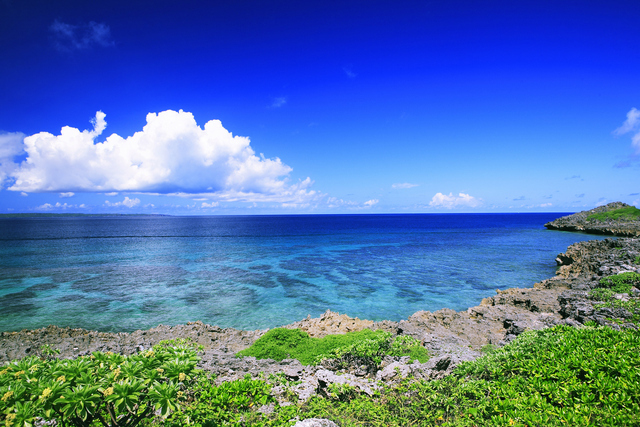 Interact with local animals in Okinawa, and try Okinawan marine activities. 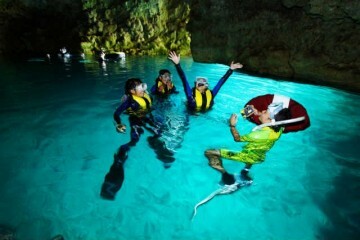 Many courses are suitable for families or groups. 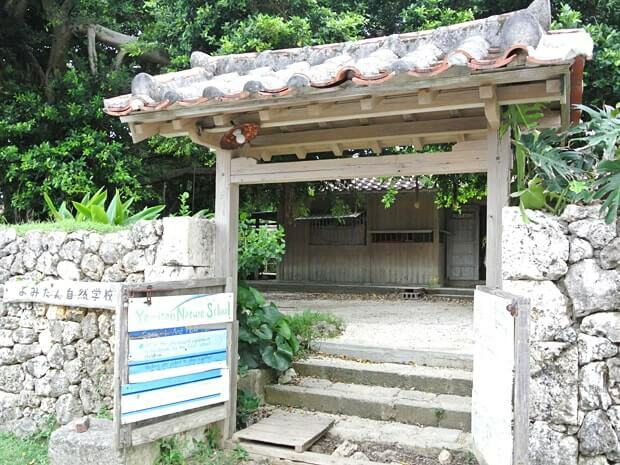 Experience at ‘Okinawa Horse Riding Club’ inside Murasaki Mura. The ‘Horse Walking Experience’ where you can take a walk with a horse, accepts children 3 years and older. 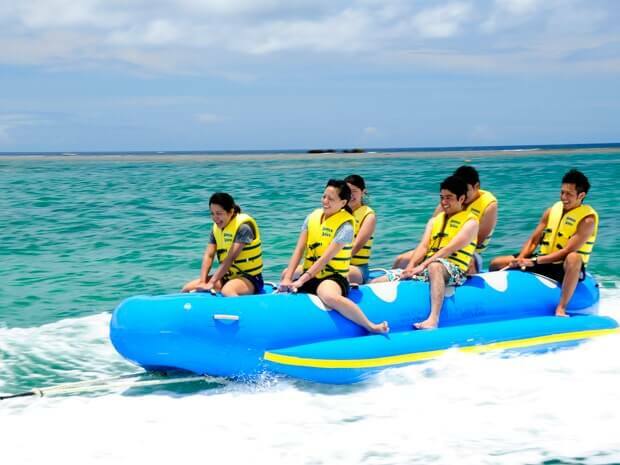 Furthermore, experienced riders can go horseback riding on the beach with the ‘Kijimuna Trekking’ experience. As you can see, there are a wide variety of activities available. Go-karting course! Elementary students or older allowed. This will probably be thrilling for boys. 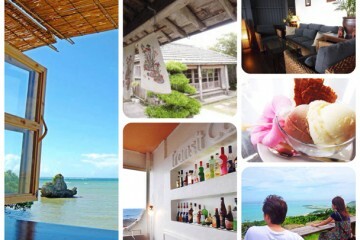 ⇒Operated at Zanpa Beach (10 minutes’ drive from Murasaki Mura). 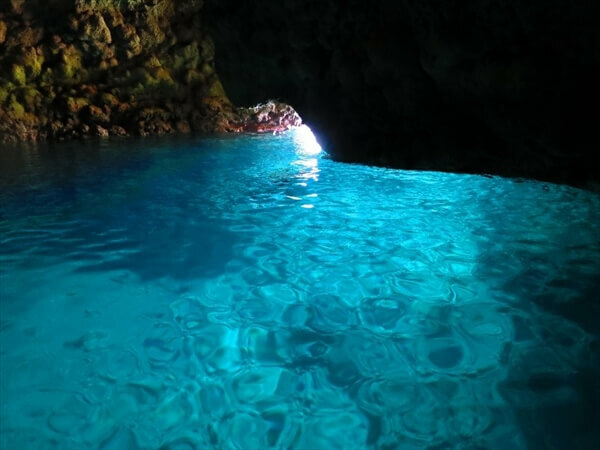 Our marine instructors will take you to the fantastic grotto. A unique plan where you can swim with a whale shark. Two and a half to three hours are required. 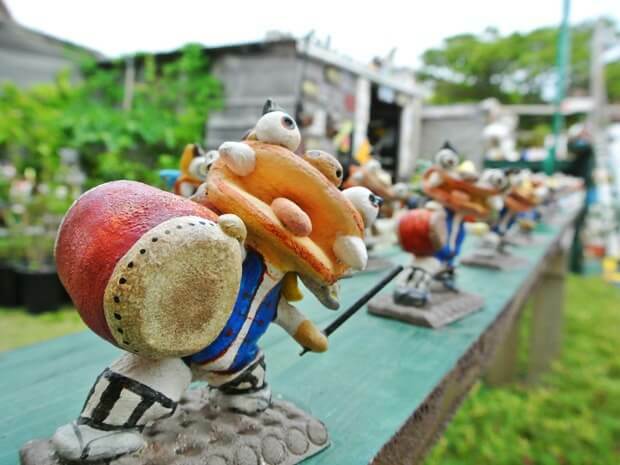 Harvest Okinawan local products and take a guided tour in Yomitan Village. The courses below require reservations and only groups with the minimum number of participants are allowed to participate. 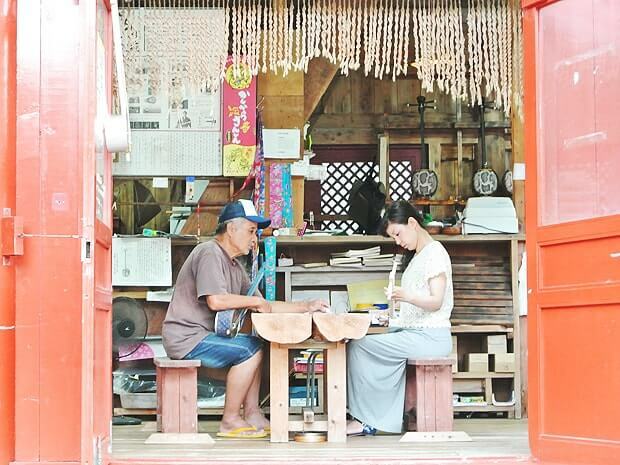 ‘Sanshin’ is a traditional Okinawan musical instrument. 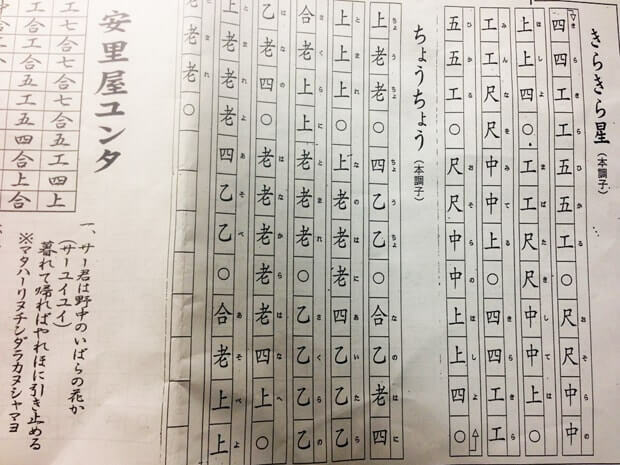 ‘Kankara Sanshin’ is its simplified version. 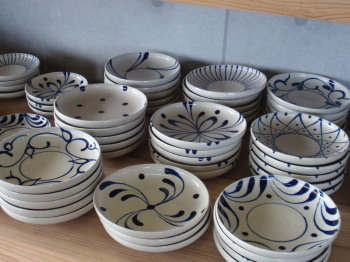 It was created at a prison camp after World War II. 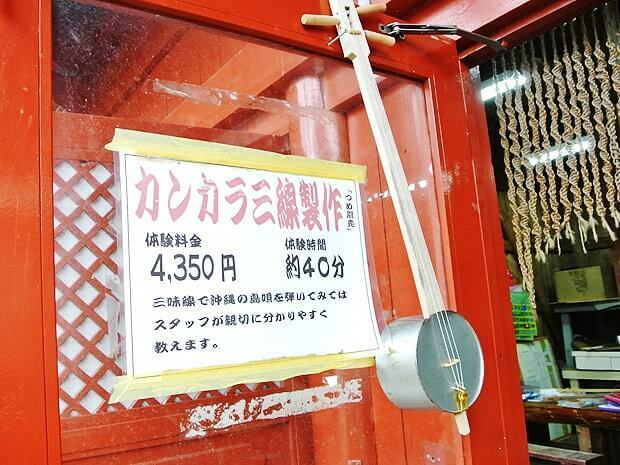 The sanshin was made using empty rationed food cans, wooden bed frames, and strings from parachutes. 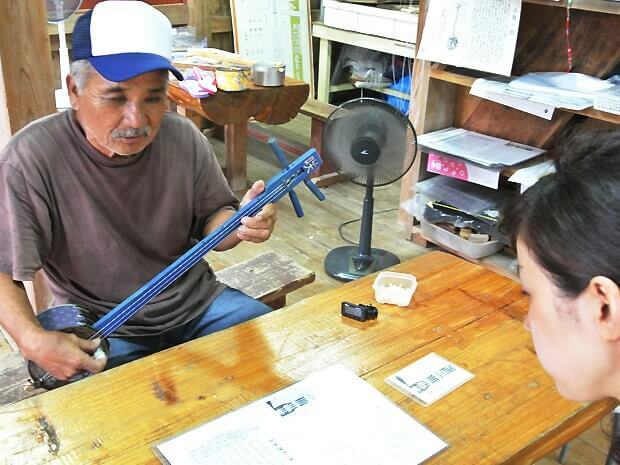 This musical instrument helped Okinawan people to remember the joy of music during a difficult time and express their feelings and ideas. 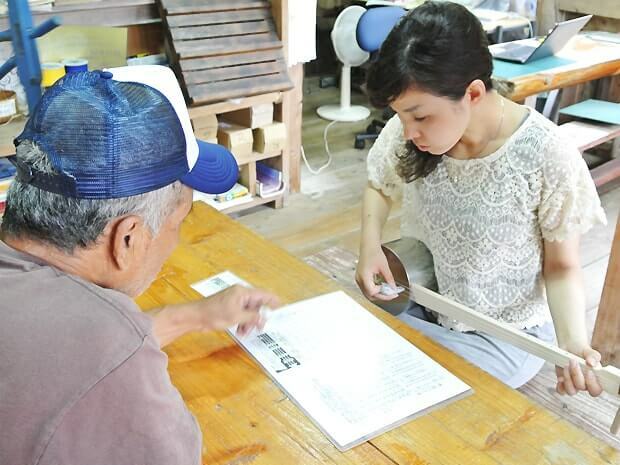 Although the name of the course is ‘Making,’ you will also receive a lecture on how to play the sanshin after producing it. The price is 4,350 yen/person including materials. 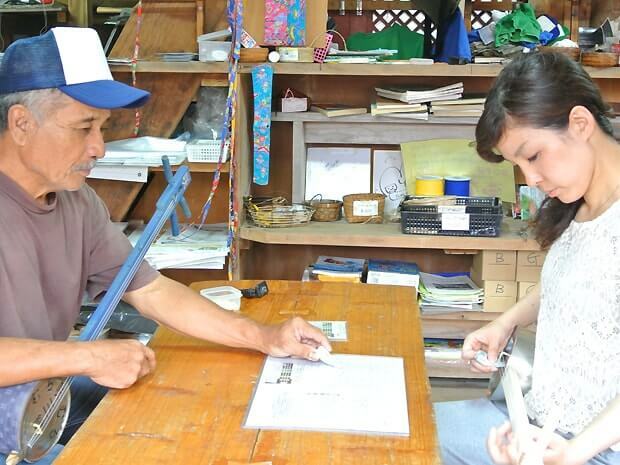 You can buy a sanshin ‘pick’ (like a guitar pick) separately if you want to play it at home. The estimated time requirement is around 1 hour. 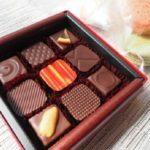 It sounds tough when you hear “create a musical instrument,” but it is actually very easy because everything is prepared beforehand. The body (made of recycled cans) and the wooden neck of the sanshin are pre-assembled. First, we begin by setting the strings. and thread the strings through the peg. Then, set the bridges to hold the strings. It’s finished! It takes less than 10 minutes total. Next, it’s time to tune the sanshin. You might find it easy if you have prior experience with string instruments such as guitar. 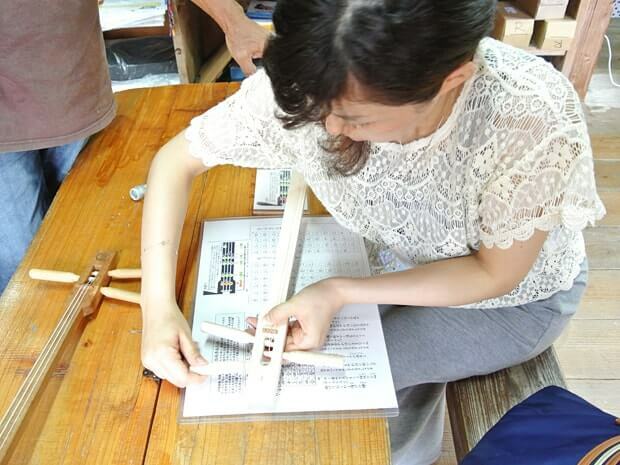 Making a sanshin is simple, but practicing is very hard! For example, C = ‘合,’ D = ‘乙,’ E = ‘老,’ etc. 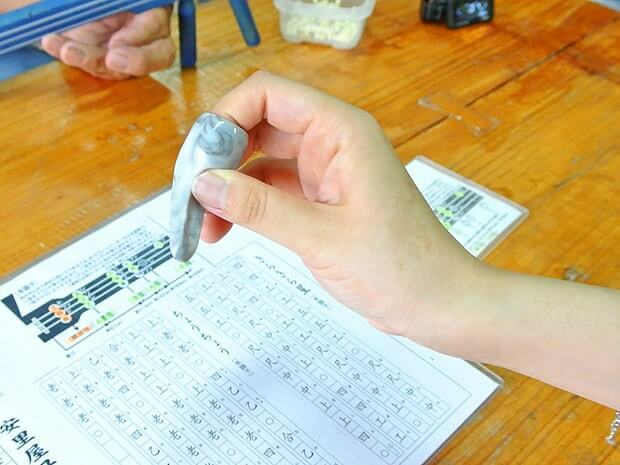 The notes are described by a single kanji character. Furthermore, the sheet music is not notated on a staff like music you have seen before. Like Chinese classical music, the sheet music is written vertically. The first time I tried to play, I struggled to make even a single sound, and could not play any melody. The first practice piece is ‘Kirakira Boshi’ (‘Twinkle Twinkle Little Star’) with simple melodies. Although the teacher told me which string to play saying, “Next is “乙,” it was really hard! It took me 10 minutes and even though I got stuck sometimes, I finally reached the end. I felt a big sense of accomplishment! 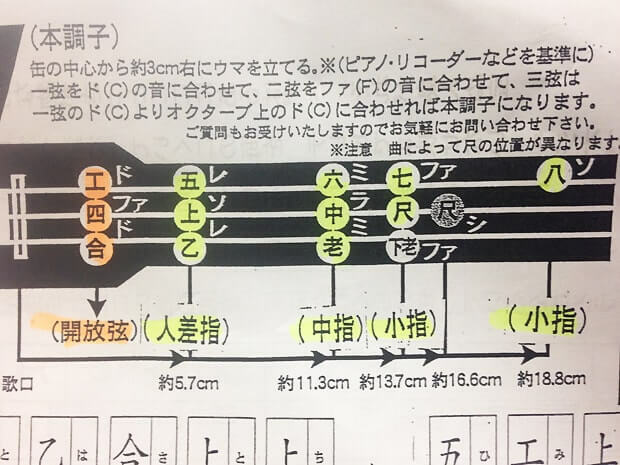 The teacher said, “let’s play and sing” while I was practicing an easy children’s song. 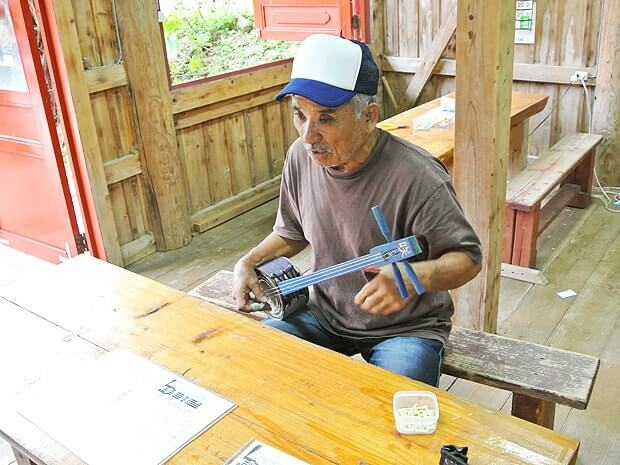 “Is it difficult to play “Nada Soso?” (a famous Okinawan song). The teacher said, “that’s easy,” and brought the music score… But it was pretty tough for a beginner like me! I tried to sing… But I could only focus on playing, and the singing didn’t follow. Still, I managed to finish a verse. It was difficult, but I was very happy I could play an Okinawan song! 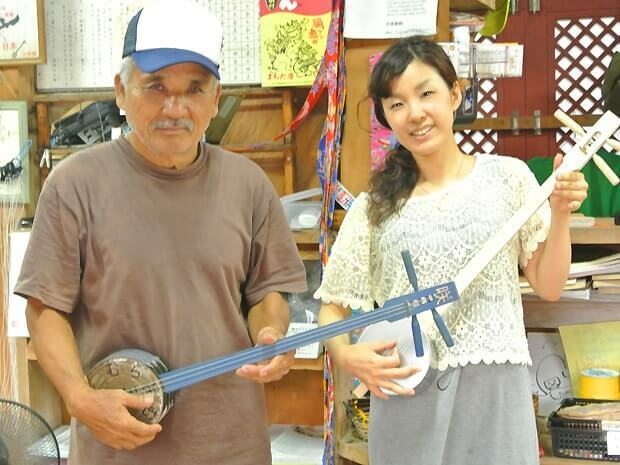 I wanted to play it at home, so I asked about the maintenance of the Kankara Sanshin. Then, the experience was finished. I brought my Kankara Sanshin and sheet music back home in a plastic bag. 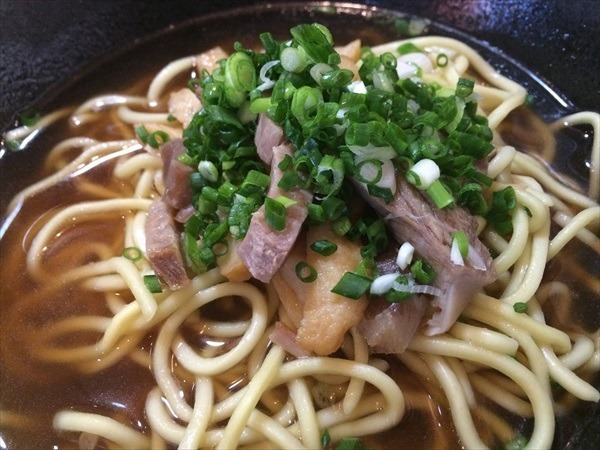 You can eat as much ‘tebichi’ (pork legs), ‘taco rice,’ and Okinawa soba as you want at the buffet. 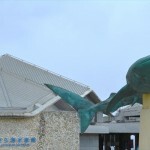 It operates as ‘Sobadokoro Shikinaeti’ at lunchtime and ‘Ryukyu Bukeyashiki Shikinatei’ at nighttime. 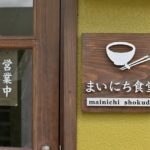 A cozy restaurant where you can enjoy foods such as Okinawa soba, rice bowl dishes, and shaved ice. 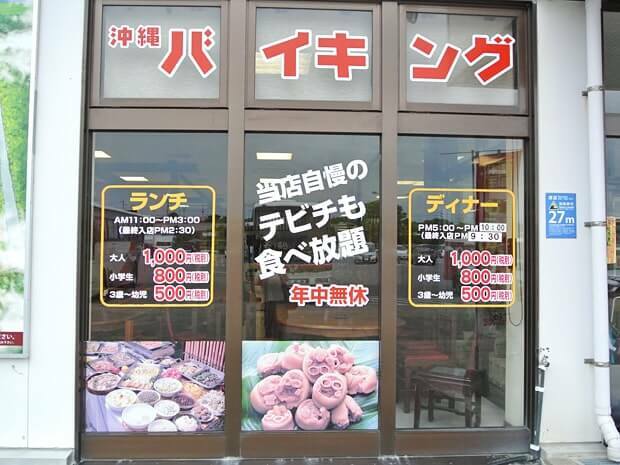 Open on Fridays and Saturdays only (18:30-21:00). There is also entertainment performed from 19:10. It is a multipurpose banquet hall with a 300-seat capacity. There is also another space where you can have light meals. ‘Hotel Murasaki Mura’ is located on site. 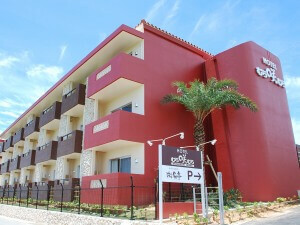 This is still a new accommodation, which opened in summer 2010. 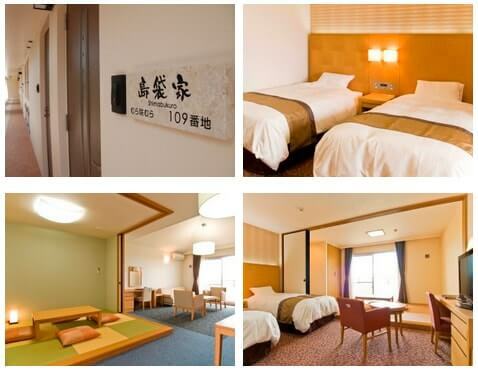 It has 39 guest rooms in total. Compared to larger resort hotels, this hotel’s compact size allows people to move around easily from their rooms to other amenities in the area. Etc…, All these things are their own attractions. There are creative personal touches on the number plates in each guest room. The experiences you had using all five senses will remain in your memory forever. 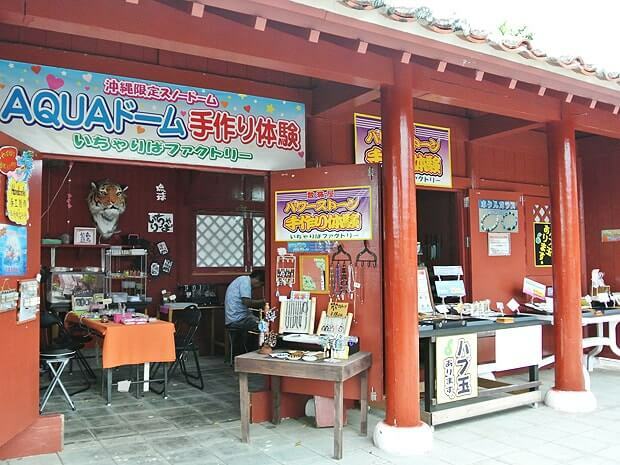 You will also get to keep the Okinawan accessories you made by yourself as mementos of your trip. 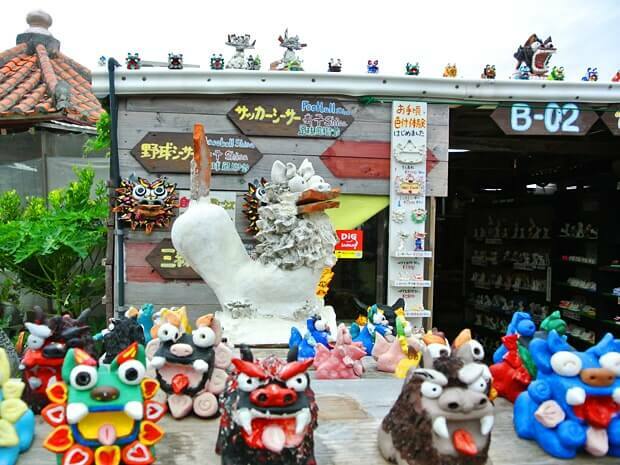 We definitely recommend that you visit ‘Murasaki Mura’ to create fond memories on your trip. 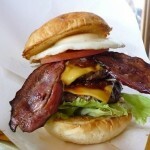 6 Delicious Hamburgers which satisfies even US Armys in Okinawa!